Kyle Adams, from Leesburg, VA, is entering is 3rd season at Bellair. He loves the freedom that farming gives him and the ability to provide, fresh, local food to people. He is also pumped that Bellair is working with the International Rescue Committee (IRC) in Charlottesville. Although, not grown on the farm his favorite veggie is asparagus. In his free time Kyle plays the bass and guitar with Marina and Alex or hangs out with his two dogs, Ella and Louie. Kyle practices muay thai to keep the farm safe, pick up heavy carrots, and occasionally knee Alex in the face. Chelsea Barbour, originally from Maryland but lived in KY, NC, and VA, Chelsea came to Bellair to be close to the Shenandoah Valley. This will be her 3rd season at Bellair, Chelsea can be easily recognized in her classic crocs and leggings tearing it up in the field. Her contagious laugh and motivating attitude help get the job done. She hopes to have her own farm one day with her partner but in the meantime loves pulling up plastic mulch and waiting for the baby kits to arrive. In her spare time Chelsea trains to be a VA master naturalist, goes on slow jogs around the farm with her dogs, Skeeter and Kira, or is tidying up. Jean Foster, this smiling face can be seen each Saturday at the barn chatting with CSA members and giving the rabbits extra carrots. Jean has been working and volunteering at Bellair since the start, this is her 9th season, and it clearly shows! Her love for fresh, good food and caring for animals is seen each day at Bellair. For Jean the best memories come from the crew each season and her amazing boss, Jamie. Her veggies of choice are pink beauty tomatoes or a zucchini. When she isn’t at Bellair, Jean can be found hiking, biking, at home with all of her amazing pets, or working at the Pie Chest in downtown Charlottesville. 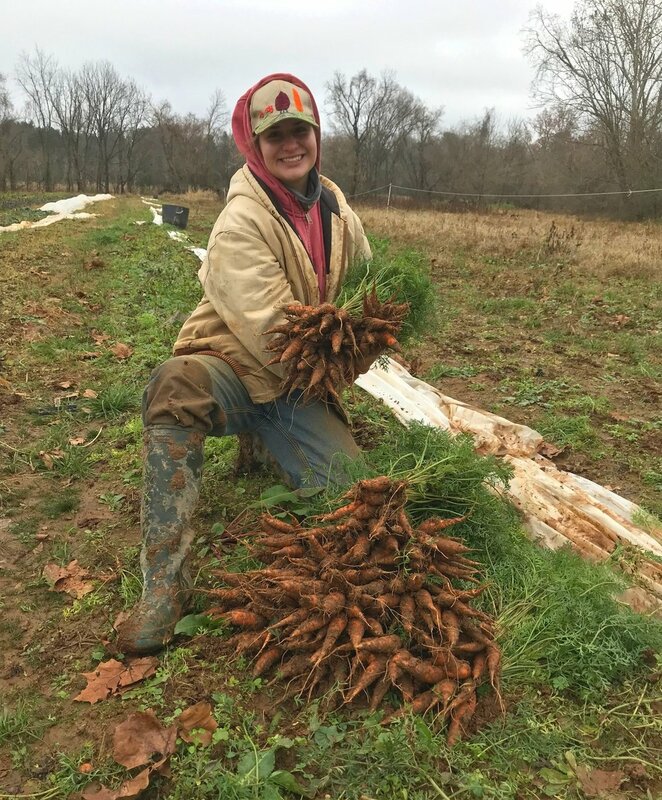 Emily Hastings, a Morven Kitchen Garden intern turned full time farmer! 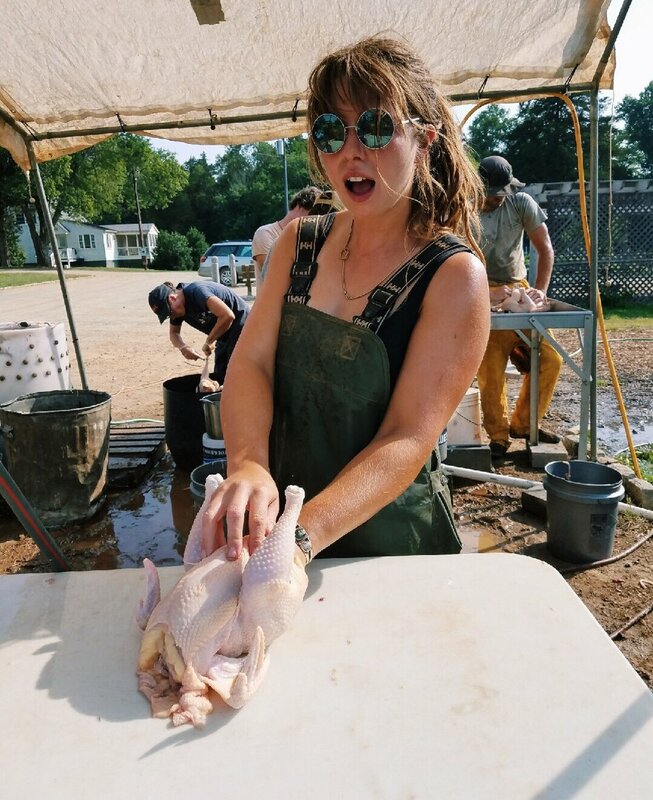 Emily began working at Bellair while attending UVA but after graduation couldn’t get enough and has been farming and living in the crew house since. 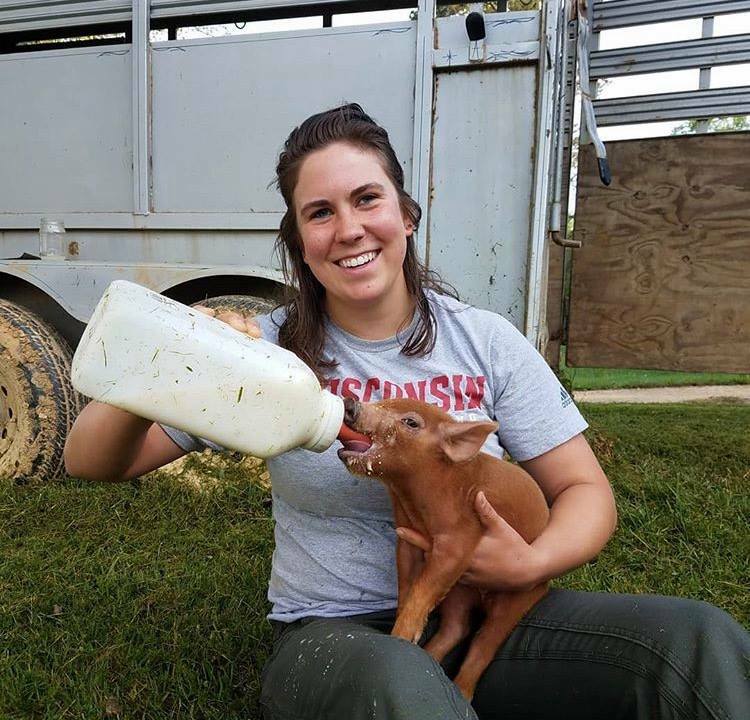 Emily loves farming because after a long, hard day you come home worn out, exhausted, and covered in mud but feeling great because of everything that has been accomplished- not to mention all the people Bellair feeds! She loves a good carmen pepper and cuddling with her new chubby cat Voodoo. Emily can be found tearing it up on the Blue Ridge Parkway in her camry listening to great jams. Alex Rickman, from Lexington, KY, is entering his 3rd season at Bellair. Alex’s favorite parts of farming are that there is no dress code and that he is gaining valuable skills for the apocalypse. He has mastered the art of the scuffle hoe and each time you pass a perfectly laid bed in the field it’s undoubtedly Alex’s work. Additionally, helping with rabbit processing, raising turkey’s, and his dry corn garden are all evidence of a well rounded farmer. Alex swears by collard greens slowly cooked in apple cider vinegar and honey but also loves to cook meat and bake bread. His two dogs, Kira and Skeeter, can always be found near as he plays the piano or guitar. Lane Rylander, a Charlottesville native, is going into her 4th season at Bellair. Lane is wicked fast at vegetable harvesting, chicken processing and anything else in between. She looks forward to the crazy hot, crazy heavy harvest days that are rewarded with a jump in the pond. When she isn’t farming she, well, is farming more. Lane helps at a cattle ranch in Scottsville and this past season worked at Free Union Grass Farm. Lane also enjoys reading about farming, eating an array of cured meats, or cooking delicious food. Her dog, Luka, takes command of the storage barn and although intimidating, most likely just wants to lick anyone’s face or wag his tail at full force. Mercedes Talvitie, just wrapped up her 1st season farming and is obsessed. She loves that there are endless things to learn, new tricks to master, and to challenge herself each day. Mercedes came to Bellair after a six month conscription in the Finnish military and bizarrely draws parallels between the two. She is extremely grateful for Bellair but is cutting her 2nd season short to get her masters degree at the University of Wisconsin. Her fav memories are the time she accidentally delivered a live chicken instead of a frozen one, bottle feeding calves, and finding a hawk in the chicken coop. When she’s not at Bellair, Mercedes listens to Ariana Grande and complains about cooking.